Twenty eight hundred years ago, Sushrata, a physician from India, treated cataracts (clouding of the lens) through couching, i.e., sticking a needle through the front part of the eye and pushing it to the back of the eye. After a perfect operation there “will be shining like the dazzling sun in cloudless sky.” Needless to say we have come a long way from then. Learn how the evolution of modern technology has profoundly changed our ability to help those who cannot see. Find out what this small but incredible part of our body does on a daily basis to allow us to run and play, read and watch. Dr. Robert Weisenthal has spent 30 years studying and treating two 24 mm globes found just above the nose and below the eyebrows. 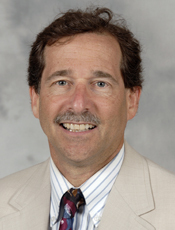 He is presently a Clinical Professor and Chief of the Cornea Service at Upstate Medical University. Why has he devoted so much time and effort to this very small but important part of your body training at the University of Pennsylvania and University of Iowa to learn advanced surgical techniques in order to remove cataracts and perform corneal transplant surgery? Because he feels there is no greater gift than to provide sight. He has personally performed over 30,000 eye operations and believe it or not – he is not yet bored, practicing with the same enthusiasm as he had on the first day. He is the founder of Laserview of CNY, the area’s first center for LASIK in 1995, and the area’s first ambulatory surgery center, the Specialty Surgery Center in 2000. He has been named a Best Doctor every year since 2005 and has been awarded the prestigious Achievement Award from the American Academy of Ophthalmology for his work in teaching and writing. Most important he is the father of three boys whom he has been watching closely since they were born. TACNY Junior Cafe Scientifique, a program for middle-school students founded in 2005, features discussions between scientists and students about topics in the fields of science, technology, engineering and mathematics in an informal atmosphere and seeks to encourage students to consider careers in these areas. Students must be accompanied by an adult and can explore the MOST at no cost after the event.